Soleimani Gorgani, S., Samadizadeh, M. (2016). Design of a New Nano Hinge Molecular Machine Based on Nitrogen Inversion: Computational Investigation. Iranian Journal of Chemistry and Chemical Engineering (IJCCE), 35(1), 11-15. Sara Soleimani Gorgani; Marjaneh Samadizadeh. "Design of a New Nano Hinge Molecular Machine Based on Nitrogen Inversion: Computational Investigation". Iranian Journal of Chemistry and Chemical Engineering (IJCCE), 35, 1, 2016, 11-15. Soleimani Gorgani, S., Samadizadeh, M. (2016). 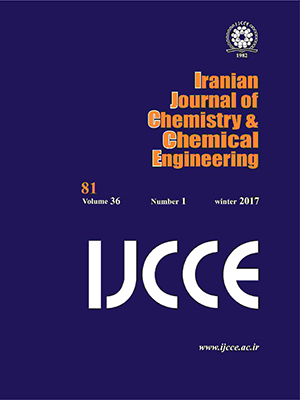 'Design of a New Nano Hinge Molecular Machine Based on Nitrogen Inversion: Computational Investigation', Iranian Journal of Chemistry and Chemical Engineering (IJCCE), 35(1), pp. 11-15. Soleimani Gorgani, S., Samadizadeh, M. Design of a New Nano Hinge Molecular Machine Based on Nitrogen Inversion: Computational Investigation. Iranian Journal of Chemistry and Chemical Engineering (IJCCE), 2016; 35(1): 11-15. Ab initio calculations were employed to investigate nitrogen inversion as a configuration change that can supply an infinitely useful switchable control mechanism for some complex systems. In this paper, design of a new artificial molecular nanohinge is discussed based on nitrogen inversion in which reciprocating motion of substituent in effect of inversion phenomenon, led to an open–close motion in the molecule. Since the simple secondary amines easily face inversion process in the room temperature, a carboxamide derivative was selected as the initial driver for the molecular motion. The most critical finding from this study was that, following the displacement of the substituent attached to the amide nitrogen,making the xanthenes planar be dislocated and form hinge like reversible move. Credi A., Artificial Molecular Motors Powered by Light, Aust. J. Chem., 59: 157-169 (2006). Zheng Y. B., Hao Q., Yang Y-W., Kiraly B., Chiang I-K., Huang T. J., Light-driven Artificial Molecular Machines, J. Nanophoton., 4: 042501 (2010). Pathem B.K., Claridge S.A., Zheng Y.B., Weiss P.S., Molecular Switches and Motors on Surfaces, Annu. Rev. Phys. Chem., 64: 605-630 (2013). Ghosh A., Fischer P. ,Controlled Propulsion of Artificial Magnetic Nanostructured Propellers, NanoLetters, 9(6): 2243-2245 (2009). Cavalcanti A., Shirinzadeh B., Zhang M., C. Kretly L., Nanorobot Hardware Architecture for Medical Defense, Sensors, 8: 2932-2958 (2008). Kinbara K., Aida T., Toward Intelligent Molecular Machines: Directed Motions of Biological and Artificial Molecules and Assemblies, Chem. Rev, 105 (4): 1377-1400 (2005). Kay E R., Leigh D A., Zerbetto F., Synthetic Molecular Motors and Mechanical Machines, Angew. Chem. Int. Ed, 46: 72-191 (2007). Knorr R., Ruhdorfer J., Mehlstäubl J., Böhrer P. Stephenson DS., (E, Z)1-Equilibria, 17 Demonstration of the Nitrogen Inversion Mechanism of Imines in a Schiff Base Mode, Eur. J. Inorg. Chem, 126: 747-754 (1993). Hough A. J., "Photochemical Control of Pyramidal Inversion and Photoactivation of Antimicrobial Agents", PhD Thesis, University of Warwick (2013). Park G., Kim S., Kang H., Substituents Effect on Aziridine Chemistry: N-Inversion Energy, Reactivity and Regioselectivity of Nucleophilic Ring-opening, Bull. Korean Chem. Soc, 26: 1339 (2005). Glaser R., Yin J., Miller S., Asymmetry in the N-Inversion of Heteroarene Imines: Pyrimidin-4(3H)-Imine, Pyridin-2(1H)-Imine, and 1H-Purine-6(9H)-Imine, J. Org. Chem., 75(4):1132-1142 (2010). Yavari I., Nouri-shargh D., Fallah Bagher Shaidaii H., Dadgar M., MNDO Study of Nitrogen Atom Inversion in Piperazine, N,N'-Dimethylpiperazine and N,N'-Dichloropiperazine, Iran. J. Chem. & Chem. Eng. (IJCCE), 16 (2): 63-67 (1997). Davies M.W., Shipman M., H.R. Tucker J., Walsh T.R.,Control of Pyramidal Inversion Rates by Redox Switching, J. Am. Chem. Soc. 128: 14260-14261 (2006). CAREY F A., SUNDBERG R J., “Advanced Organic Chemistry”, University of Virginia, Charlottesville, Virginia, (2007).